For over 35 years we have been designing, building and manufacturing fireplaces. One of the reasons Acucraft has been successful in the fireplace industry is by using only the best, highest-quality materials available for each and every one of our gas, wood and outdoor fire features. The integrity of our product is backed by our Lifetime Guarantee and believe you should have a lifetime of enjoyment from your fire feature! Well, at Acucraft we over-build our units using thick steel, welding all major seams inside and out, and pre-engineer all of our components for ease of use. Not only do we use the highest quality materials and components for our fireplaces, but our Fireplace Advisors and Designers work hand-in-hand with you to ensure you receive the fireplace of your dreams. Our Fireplace Advisors take the time to fully understand your design, needs and vision for your project. Our Fireplace Designers ensure full functionality & safety of your concept, and our Fireplace Craftsmen bring your design to life. Every custom gas fireplace is internally tested by our Test Lab Technicians before shipping to your site. The perfect certified linear gas fireplace for any commercial (or residential!) space. Combined with the tallest flames on the market, we push the boundaries to create truly unique products for the most discerning customer. Designed with commercial grade components, including 7-gauge steel. These fireplaces fit seamlessly in restaurants, hotels, and residential homes alike. Experience the Signature Series Difference with the perfect linear gas fireplace for your home, unlike anything on the market today! Don’t get boxed in with a stock product, our Signature Series not only boasts the tallest flames on the market, but gives you ultimate versatility by allowing you to enjoy your fireplace sealed or open at any time with our 10 minute conversion kit. Backed by our Lifetime Guarantee and rigorously tested in our internal test lab, this series gives you complete ease of mind. Inspired by a recent project for Google’s latest headquarters in Boulder, CO; our CIRCULAR4 gas fireplace continues to grow in popularity. Different than anything you’ve seen before, our standard circular fireplace provides a 360-degree unobstructed view. Looking for a show-stopping focal point for your residential or commercial space? Look no further! Our INFINITY Series brings our most requested 4-sided gas fireplace model to life. These gorgeous gas fireplaces come standard with our glass cooling package making them safe-to-touch, no more worrying about hot surfaces, these units are built to provide you with a lifetime of enjoyment! So whether you’re looking for a gas fireplace with multiple viewing areas, a fireplace that can offer you ultimate versatility, or a mammoth 4-sided fireplace for your space, our Fireplace Experts are sure to find the perfect solution for you! 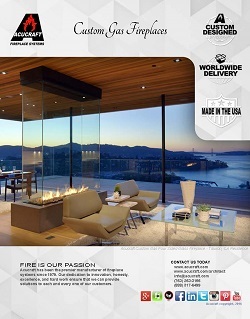 Start your own fireplace journey by requesting a copy of our gas product brochures or speaking with an Advisor today!